As the name implies, these are oceangoing birds. Although occasionally seen in some of the larger Northern Lakes, Seaducks prefer the deep, saltwaters of the ocean and coastal bays. Large numbers of Oldsquaw (long tailed duck), three types of Scoters and even a few Eider spend their winters on the waters of Virginia's Eastern Shore. They are plentiful on both the Atlantic and Chesapeake Bay sides of the Delmarva Penninsula. When hunting Seaducks, you can forget everything you have ever learned about duck hunting. Think of the blind or boat as your fort and you are there to defend it. Seaducks have little fear of humans and when the shooting starts the reason will become obvious. Seaducks come in low and fast, very fast. More often than not they leave the same way. One of the biggest problems is seeing the ducks. They can approach from any direction. If you are hunting from a blind, chances are you will be looking down at the ducks. It is much different than watching for the silhouette of a Mallard pitching in against the morning sky. Most of these birds will be arriving below the horizon. You will have to spot dark ducks against dark water. Very often this water will have a chop and/or sun glare. To say they "pitch in" is misleading. They go from full flight to a splash in a second or two. It would be better described as a crash landing. The other major problem is hitting them. Most hunters average about ten shots per bird. Some do worse, few do better. Some of the best advise I can give to Sea duck hunters was told to me by the late waterfowl guide Charles Fish. "Boys, you gotta keep shot in the air to kill these ducks. When you see'em coming in start shooting and don't quit til he lays his head right down on the water." Sea ducks are hard to kill in flight and nearly impossible to kill on the water. Cripples are a good way to keep your shot count up. At 40 yards, an unsuspecting Oldsquaw can beat your shot by diving. If he knows it's coming, you can cut that distance nearly in half. Sea ducks have an extremely heavy and tight layer of feathers which are very difficult for shot to penetrate, and besides that they are just plain tough. I have watched a single Oldsquaw come into the decoys, 25 yards from the boat. Five hunters unloaded on him, not a feather! The bird flew off in a wide arc, came back and did it again. They did it again, same results! To help eliminate the problem of a rocking boat, we have we have constructed deep water pole blinds for Sea duck hunting. The boat didn't seem to be the problem, hunters still can't hit'em! 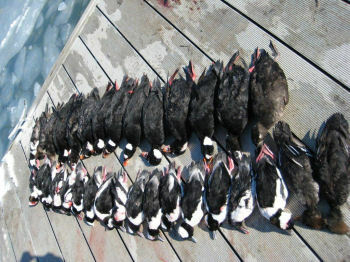 The pole blinds do enable us to hunt the days that would have been too rough to hunt by boat so it wasn't a total loss. If you like fast paced action and in your face hunting, Sea ducks are the way to go, but be sure to bring plenty of ammo. Although Hevi-shot works well, it can get kind of expensive when firing seventy five rounds a day. An alternative Hevi-Metal number 2 shot is a good choice. Sea ducks are some of the more flavorful ducks in the area. Scoters need some help in the kitchen. They are good smoked, blackened or in a stew. Oldsquaw taste like liver. They are all best breasted rather than plucked, but with a little effort they all can make a good meal. At the time of this writing, there is a 7 bird limit. This is in addition to your other limits, so Sea ducks can be a great way to fill out your day. In many areas around Chincoteague you will regularly encounter Sea ducks, Divers, Mergansers and Brant all from the same blind. That's the potential combined limit of 19 birds! I don't know if it's ever been done, but it's a realistic challenge.